At school I had no interest in the sciences whatsoever, let alone in anatomy. At that age, it was boring and irrelevant! However my attitude to anatomy changed in my second to last year at high school when I was on the verge of failing my exams. A great teacher stepped in and finally made science interesting, and what a transformation occurred from that moment. This forever highlighted for me that the art of teaching is to make the content relevant and approachable, and to have a passion for what is being taught. Well I am pleased to say that Ellen Saltonstall, author of Anatomy and Yoga: A Guide for Teachers and Students, has all this in spades. Since that great teacher over twenty years ago at high school, I have been a self-proclaimed anatomy geek. I just can’t stop revealing and unmasking the mysteries of the body. There is constantly new information emerging about the body and my mission is to not only learn more but also apply it to teaching yoga. Therefore I pick up almost any anatomy book I can find. But very few of those books make it to the altar of my bedside table, where they will be flicked through at night before I go to sleep, referenced in the morning while I plan classes and be my companion pick-up guide throughout the day. 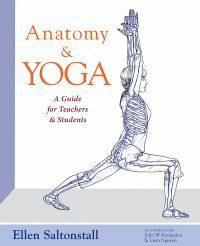 Anatomy and Yoga: A Guide for Teachers and Students made it to the altar. Ellen’s journey started in a somewhat similar way to mine – she was a dancer (I was a runner) and a massage therapist, and she wanted to go beyond the basics of knowing muscle names to figure out ‘why’ her clients had various injuries or chronic pain. She wanted to understand her own movement patterns, which lead her to the path of yoga. She was drawn – just like myself – to the anatomy-rich practices of Iyengar and Anusara. And she realised yoga’s huge potential to bring strength, openness and balance to the body and mind. Ellen has been teaching since 1985, including at many prestigious US colleges and Universities, she has co-authored two books with Dr Loren Fishman and writes for many yoga publications. Finally an anatomy book specifically for yoga that is clear, informative, practical and enlightening! The text offers many opportunities to apply the information in the moment with your own body or a fellow student. Moving, touching and feeling is the best way to learn – the kind of learning I needed at high school! Anatomy & Yoga is the perfect companion for any yoga teacher, because it fills in knowledge gaps about the human body, biomechanics and systems in a holistic and integrated way. Ellen’s writing has a rich depth without being confusing or overwhelming, and there are practical tips and questions at the end of each chapter. The book is broken down into sections of the body and accompanied by clear drawings. After reading about two pages of information there are light breaks of ‘try this now’ to integrate what you are learning into a practical sense. This allows you to feel and find bony landmarks of the body or observe the contractions of a muscle in a specific pose. Study questions at the end of each chapter keep the keen learners on their toes and it’s a gentle reminder of “just how much are you really taking in?” Even for a seasoned teacher, this is a great re-cap and consolidation of knowledge, and, like any anatomy geek, you know there is always more to know and understand about the human body! This book is a must for any student wanting to know more and for any serious teacher of yoga to have as a reference tool to help create informed, transformational practices that truly focus on the wellbeing of every student. And, perhaps even more telling, Anatomy & Yoga has not just made it on to my altar, its now also on my reading list for all yoga teachers on my development program in 2017! The rapidly growing yoga community needs this essential knowledge of biomechanics, especially in yoga teacher training programs. This book presents anatomical information in a progressive and practical sequence, with chapters on each major body part that contain illustrations, yoga references, innovative exercises, therapeutic tips and study questions. Throughout the book, anatomical details are balanced with the holistic perspective of yoga as an integrative, transformational lifelong practice. 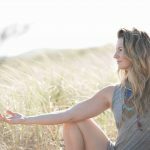 Nikki Ralston is a natural teacher who has been working with the human body for over 15 years, her passion for yoga and understanding of the human body and mind is infectious to others. Nikki has devised her own ‘Ralston Method’ which blends together the best elements of hatha, vinyasa, precision alignment and mindfulness teachings. Balanced by her delightful sense of humour that encourages students to reclaim the joy within their practice and life. Nikki regularly speaks at wellness and corporate events, teaches workshops, leads retreats and has curated a Teacher Development Program to mentor and educate new teachers guiding them on their path to greatness. The owner of Urban Ashram in Auckland, featured teacher at Wanderlust festival NZ/Aus, she is the yoga teacher to the NZ Warriors, an Ecostore ambassador, mother and wellness powerhouse. Check out her full offerings of workshops and mentor program at The Ralston Method. Thanks for the post. I am very much impressed & benefited by it.